Bravium, Latin for “reward, price or gift,” is a winery featuring traditional, minimalistic winemaking by proprietor Derek Rohlffs. 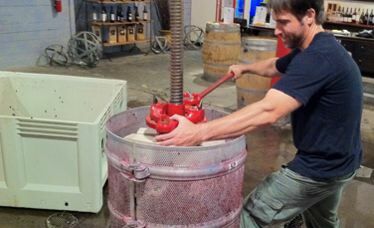 Rohilffs is a graduate of University of California at Santa Barbara in Environmental Studies and completed his winemaking course work at University of California at Davis. He has made wine since 2000 and traveled to the wine regions of France, Italy and Australia to hone his craft. Derek told me he has been inspired by the work of Kevin Harvey and Jeff Brinkman at Rhys Vineyards and Jeff has been a significant influence on his winemaking. 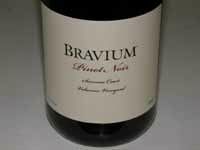 Bravium features vineyard-designated and appellation-designated Pinot Noir and Chardonnay. The winery is located on Treasure Island in the middle of San Francisco Bay. Vineyard sources include Signal Ridge Vineyard in the Mendocino Ridge AVA, the Beau Terroir Vineyard in Napa Carneros and other vineyards in Sonoma Carneros. Production is small (96 to 448 cases per wine) and the wines are sold direct to mailing list members and through select retail outlets with some restaurant placements. A portion of the profits from the sale of Bravium wines supports Sip & Give, Bravium’s charitable giving campaign. Sip & Give features a roster of worthy charities that are funded by the public’s votes (visit the webiste at www.bravium.com for more details). Simply put, Derek makes wine, you drink the wine, and together, you both sip and give. Derek is also a Member of the Cherokee Nation and Bravium is a registered TERO business. Tasting is available at Treasure Island Wines, 995 9th Street, Treasure Island. Open Saturdays and Sundays from 1:00 to 5:00. 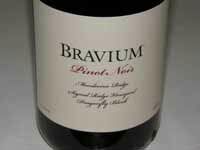 This was the first time I came across Bravium Pinot Noir and I was very impressed by the consistently high quality of each Pinot Noir bottling. The wines show deft integration of oak, judicious use of whole cluster fermentation, pleasant aromatics, flavor without weight, and bright acidity for refreshing drinking. Derek definitely has something going here and I would recommend the Pinot Noirs without reservations. 14.4% alc., pH 3.51, TA 0.60, 96 cases, $34. From the Volamus Vineyard, located in the Petaluma Gap, and planted in 1999. Dense plantings of 115, 667 and Pommard. 100% de-stemmed, native fermentation, aged in 25% new 4-year air-dried Francois Frères oak barrels. Unfined and unfiltered. · Moderately dark reddish-purple color in the glass. Great nose with explosive aromas of black cherries, redwood and spice, holding up nicely over time in the glass. Very soft in the mouth and highly flavorful with a core of black cherry and black raspberry fruits, accented with notes of dark chocolate and spice, finishing with a refreshing edge of citrus-driven acidity. Ready to go now. Very good. 14.3% alc., pH 3.47, TA 0.61, 288 cases, $34. The vineyard is on a steep mountainside three ridges in from the Pacific Ocean at 2,642 feet elevation. Relatively shallow and rocky soils. Wide variety of clones and selections including Pommard and Swan. Yields 0.65 tons per acre. 16% whole cluster, 7-day cold soak. Native fermentation in one-ton fermenters. Aged 11 months in 33% new 4-year air-dried Francois Frères oak barrels. Unfined and unfiltered. · Moderately light reddish-purple color in the glass. Aromas of cherries, deep red rose petals and pine needle. Tasty with good intensity, featuring flavors of black cherries black raspberries and pomegranates with a hint of tea. Impeccable balance with mild tannins and juicy acidity, finishing with impressive intensity. Blossomed beautifully the following day from a previously opened and re-corked bottle, displaying a dreamy, velvety mouth feel and seductive flavors. 14.4% alc., pH 3.52, TA 0.60, 96 cases, $39. Yields 0.65 tons per acre. 100% de-stemmed, 7-day cold soak, native fermentation, aged in neutral French oak barrels. Unfined and unfiltered. · Moderately light reddish-purple color in the glass. Nicely perfumed with aromas of dark red cherries and berries, fruit bin and mushrooms. A little riper and more savory with flavors of black cherries, plum, spice and mushrooms. The tannins are soft and supple and the finish is juicy and appealing. Very good. 14.3% alc., pH 3.49, TA 0.60, 72 cases, $39. Yields 0.65 tons per acre. 20% whole cluster, native fermentation, aged in 33% new 4-year air-dried Francois Frères oak barrels. 25% whole cluster, 7-day cold soak, native fermentation, aged in 66% new Francois Frères oak barrels. Unfined and unfiltered. · Moderately light reddish-purple color in the glass. Aromas of cherries, cassis, spice and oak. Redder fruits are featured on a mid weight frame. Light and juicy with supple tannins and a good finishing grip of acidity. Pleasant and easy to drink, but lacks a mid palate and finishing punch of fruit. Good (+). 14.2% alc., pH 3.39, TA 0.634, 72 cases, $39. Yields 0.65 tons per acre. 25% whole cluster, 7-day cold soak, native fermentation, aged in 66% new 4-year air-dried Francois Frères oak barrels. Unfined and unfiltered. · Incredible nose that keeps pumping out aromas of fresh dark berries over time in the glass. Delicious core of black cherry and dark berry fruits, exotically spiced with a hint of toasty oak in the background. A seamless wine with powdery tannins and a finishing lift of decadent fruit that returns in waves for several encores. An exceptionally dreamy wine. 12.3% alc., pH 3.27, TA 0.697, 84 cases, $19, screwcap. 98% Pinot Noir (Signal Ridge Vineyard) and 2% Chardonnay. Aged in both stainless tanks and neutral oak. Unfined. · Moderately light red color in the glass. Aromas of strawberry, cranberry, cherry, blood orange and floral tones. Soft and perfumey on the palate, with flavors of strawberries, cherries, and red hard candy. Very fruity in style with a subtle sweet character. Decent. 14.3% alc. pH 3.51, TA 0.6, 288 cases, $24. Clones 17, 76, 96 and 97. Aged in a combination of oak barrels and tanks. Partial MLF. Unfined. · Very light yellow color and clear in the glass. Aromas of lemon, nuts, honeysuckle and seasoned oak. Light, soft and delicately flavored, with notes of pear, hazelnut and caramel. A well-crafted, but very understated style that just didn’t grab my attention. Decent.